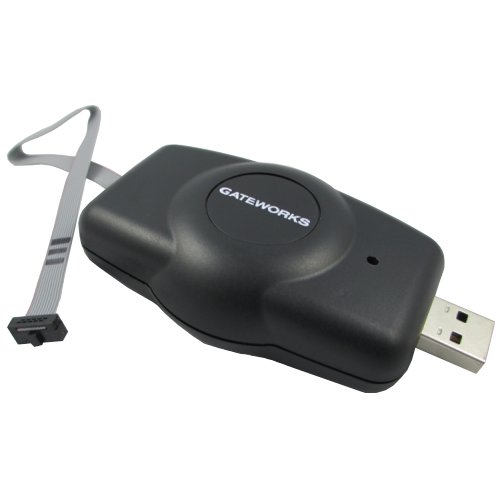 The GW11033 USB JTAG programmer kit consists of the GW16099 JTAG programmer, 6ft USB extension cable and JTAG software CD. The GW11033 is for all Ventana and Newport SBCs. It works on some Laguna boards, such as the GW2380 and GW2382. The GW16099 JTAG programmer allows users to Flash images to many network platforms on-board Flash memory through a USB connection from a standard PC development platform. See exceptions on wiki here. The GW16099 JTAG programmer also allows for serial console access over the same JTAG interface.